Ireland have reported no fresh injury worries following their 28-22 World Cup warm-up win over Scotland at the Aviva Stadium in Dublin on Saturday. Simon Zebo limped from the field, to be replaced by Paddy Jackson, with three minutes remaining, but the Munster back was not mentioned as being an injury concern in Monday's medical bulletin. The squad has been released for a week and will reassemble on 23 August. Their third warm-up game is against Wales in Dublin on Saturday 29 August. 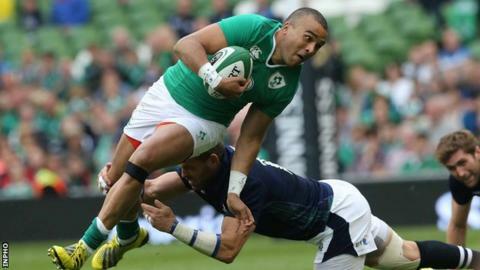 Ireland beat the Welsh 35-21 in their opening preparation game for the World Cup in Cardiff on 8 August. Ulster winger Andrew Trimble missed the victory over the Scots with a foot injury but is making good progress in his recovery, while the medical team continue to monitor Cian Healy as he recovers from neck surgery. Prop Marty Moore could feature for Leinster against Ulster in a friendly in Belfast on Friday as he continues to recover from shoulder surgery. Ireland face Canada in their first World Cup Pool D game in Cardiff on 19 September.